First-class panel extruder forming machine is our special developed products as results of our engineers research, with which 60% steel material will be saved compared with traditional revolving die method. Efficiency can be improved 3 to 5 times compared with conical die method, these machine are easy for operation and convenient for maintenance, products from these machines are in good quality, smooth appearance and accurate in size. 1.Wire cables are used toÂ fastenÂ machines on the trailer or inside the container. 2.Machine covered with plastic film or tarpulin. 3.Machines can be packed in tarpaulin or wooden case according to customer's needs etc. 1.Free quick wear parts with new machines delivery. 2.Low charges continuous maintenance when warranty is expired. 4.One year global warranty for whole machine (except spare part). 1. WhenÂ didÂ yourÂ companyÂ established? 2. WhereÂ isÂ yourÂ companyÂ situated? XingYuÂ machineÂ isÂ locatedÂ inÂ ZiBoÂ city,Â ShanDongÂ provinceÂ China. YouÂ canÂ takeÂ plainÂ toÂ JiNanÂ airport,Â weÂ willÂ pickÂ youÂ upÂ inÂ JiNan. 3. WhatÂ isÂ yourÂ paymentÂ term? WeÂ willÂ provideÂ youÂ theÂ bankÂ detail.Â Generally,Â 30%Â prepaidÂ andÂ theÂ restÂ 70%Â shouldÂ beÂ paidÂ beforeÂ shipping. OurÂ machineÂ isÂ totallyÂ differentÂ fromÂ EuropeanÂ machine.Â PleaseÂ don'tÂ followÂ theirÂ instructions. 5. What is you main products? 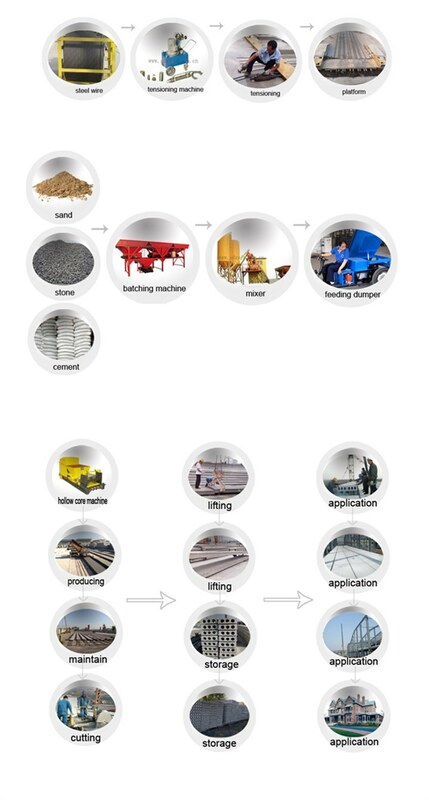 Mainly products for precast concrete hollow core slab machine, lightweight wall panel making machine, purline/lintel/column machine, H beam/T beam, slab cutting machine,Â feeding dumper, tensioning machine, concrete mixer and concrete batching plant, steel wire boxÂ and so on. For you, we will do better and better.